This morning while I was breezing through the kitchen I caught sight of a Christmas present. A sign hanging above the mudroom doorway that says “The Lord will fight for you; you need only to be still.” A favorite verse, a needed reminder. As I went about my business and tried to focus my twitchy, squirmy thoughts together I was reminded that “still” is so often harder than it seems when it comes to our minds. (Maybe this is just a phenomenon I suffer from.) I was breezing through the kitchen with a load of laundry to add to the piles that needed washed, while mentally creating a list of things I needed to get from the store before the next big snow storm hits (new totals up to 10 inches in the next 24 hours with wind chill values of -25.) I was also digesting the last couple of days while looking around at the Christmas stuff that needs taken down (I feel like I just got it up!) and trying to figure out the upcoming week’s schedule for back-to-school, practices, travel, work, doctor’s appointments, etc. We ended 2013 and kicked off 2014 with a bang! Actually it was more like a series of small explosions. Curve balls that life keeps throwing and I try to keep batting away, so as not to strike out. It is mentally exhausting in addition to being at times physically trying. I am not complaining (at least not much) and I keep asking, “Really? More?” God really does have a sense of humor and my prayer the last couple of days is “Lord, I really don’t need any more raw footage to write about. Some quiet would be very much appreciated.” I refuse to ask the question, “What else could go wrong?” because I really don’t want to know. Nothing that has crossed the plate over the last few weeks has been a tragedy or crisis and I am thankful for that. There have been many stories very close to home over the holidays that are tragic and my heart breaks for families and individuals who truly are suffering right now. What I am talking about is more like what I would assume Chinese water torture would be like, mentally taxing. After a flu-filled “different Christmas” (3 different strains over 10 days) I was looking forward to escaping for a night to Amish country to celebrate 15 years of being married to my husband and very best friend. (Man, I love that guy!) We were going to watch some college football (I am a huge fan!) browse the shops and eat some wonderful food that I didn’t have to cook. Then winter storm Hercules hit and canceled our plans. Not a big deal, we celebrated at home, still watched football, and enjoyed our kids enjoying the sledding hill. We also had plans to finish Christmas vacation at an indoor water park with my sisters and their families. We checked in on Friday, the kids took a quick spin on the slides and my husband took our son to basketball. Five minutes after they left I got a notification from our security company that our the alarm was going off at home. So after he dropped our son at basketball he returned home to talk with the police. False alarm apparently, no footprints in the snow, nothing amiss in the house. Then came the call from the basketball coach, our son took a charge, went knee to knee with another player and his was swollen up like a balloon. We ended up in urgent care where x-rays were done, our daughter left to play in the water park with her cousins. The x-rays showed no fracture but a small white spot was discovered on his femur, not common and very disconcerting according to the physicians assistant. She wanted us to stay and wait while the radiologist read it, hoping to hear specifically about “the spot.” The official reading came back with no mention of the spot, only the news that nothing was broken. But what about the spot? What do we do with this piece of information? Is it something? Is it nothing? I guess that’s to be continued. (This after having a scare at Thanksgiving when he had an ekg because of some symptoms that led to a report of an enlarged ventricle and a thickening of his heart muscle. The report was later discovered to be inaccurate but not after 5 days of prayerful wondering, worrying, and waiting.) Friday’s diagnosis was a severe knee sprain, crutches and a knee brace for a week (which we already had from his prior knee injury 9 months ago) and a follow up for an MRI to make sure everything else is intact. (I am not so sure it is…) Three days later I am mothering a child who is frustrated about missing out on games, practices, sledding, the inability to walk up and down the steps and bend his still swollen and very sore knee. Our daughter, and her extremely sensitive skin, came home from the water park with a mysterious face rash, and then, we’ll call it the icing on the cake, the check engine light came on in our car on the way home from our tumultuous waterpark stay. So, to recap, in a 24 hour period, police, hospitals, rashes, and finally car trouble. Drip, drip, drip, drip, drip. Now you are up to speed as I again breeze through the kitchen arms loaded down this time with Christmas things that need to find a home, mind loaded down with family, work, and ministry concerns and to-dos, and sense of being tired instead of rejuvenated after Christmas “vacation.” Drip, drip, drip, drip. I need to remind myself of my new years resolution already, only 5 days in. Choose Faith. And as I sit, finally still, and bring my thoughts from my head to the page, I am reminded of a few other things that I am sure will come in handy as we charge into a new year. There are days when we need to laugh to keep from crying. And then there are days when we’ll have to laugh as the tears roll anyway. But laugh, always laugh. Nobody likes to be benched but sometimes we need to “ride the pine” and get healthy again. Interruptions are not part of our plan but they are part of life. Remember always that God is in control, nothing is an accident. Take a deep breath and rest during your break so when your number gets called you are ready to go back in and give it 100% again. I leave you today with this, a very dear friend and mentor sent this to me as I was grumbling about everything that had been going on. 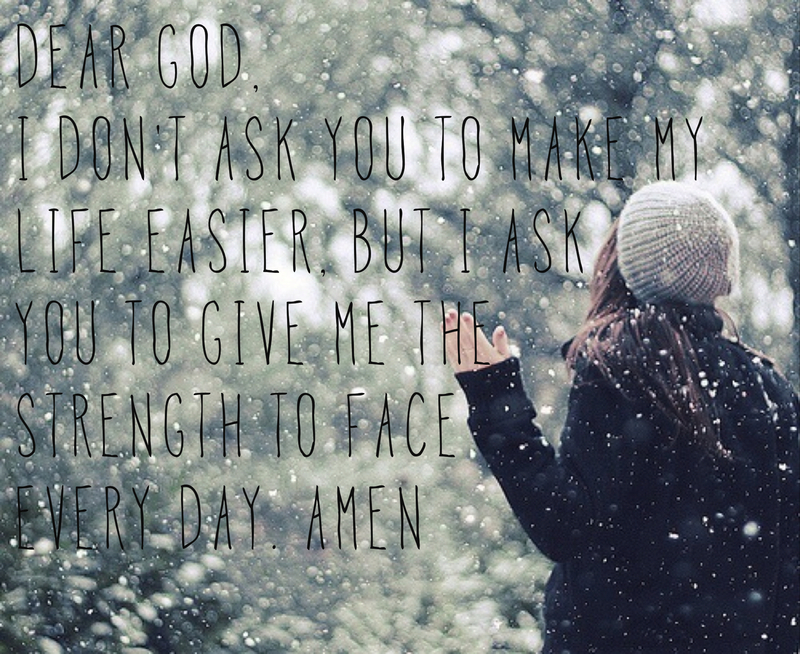 A simple, yet effective prayer on days when the Chinese water torture seems to be getting the best of you.